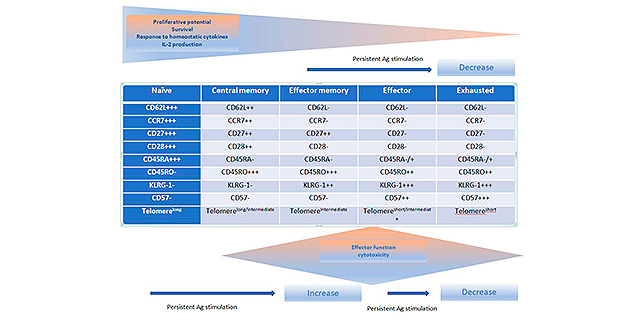 Aim: Patients with glioblastomas demonstrate well-documented immunological impairments including decreased numbers of mature dendritic cells (DCs). Recent data identified karyopherin a2 (KPNA2), a nucleocytoplasmic shuttling receptor, as diagnostic and prognostic biomarker for gliomas. The aim of this ongoing study is to correlate parameters of immunity and nucleocytoplasmic transport in glioblastoma patients. Methods: We preoperatively collected serum from 17 patients with glioblastomas and determined DC subsets (HLA DR+ Lin-, CD34-, CD45+, CD123+, CD11+ were analyzed) using a 6-color flow cytometry panel. 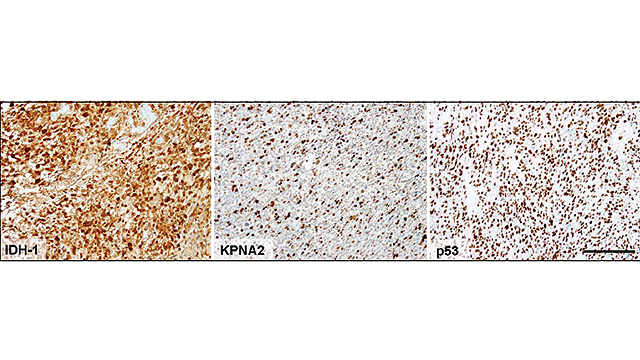 Expression levels of KPNA2 and nuclear accumulation of p53 were evaluated semi-quantitatively by immunohistochemistry. 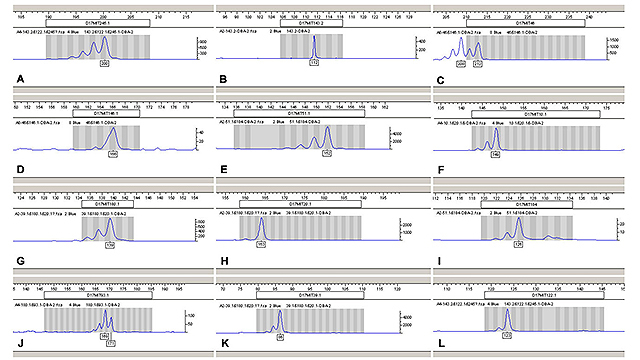 O6-methylguanine DNA methyltransferase (MGMT) and isocitrate dehydrogenase-1 (IDH-1) status were assessed by pyrosequencing and immunohistochemistry, respectively. Results: Median expression levels for both KPNA2 and p53 were 5-10%. IDH-1-R132H mutation and MGMT promoter hypermethylation was detected in 3/16 and 1/9 patients, respectively. Mean counts of total mature DCs, myeloid DCs and plasmacytoid DCs were 9.6, 2.1, 3.4 cells/μL. A preliminary analysis suggests an association between low KPNA2 nuclear expression and increased numbers of mature DCs. However, this correlation did not reach statistical significance so far (P = 0.077). Conclusion: Our preliminary data may indicate a role of KPNA2 in the impaired maturation of DCs observed in glioblastoma patients. Any disease can be treated only once it is imaged, detected and classified. This paper proposes a set of algorithms for classification of a brain tumor with better accuracy and efficiency. The proposal uses a JPEG format of the DICOM image fed into three stages namely pre-processing, segmentation using sub-pixel edge detection method and using the nearest neighbor methodology for the detection and differentiation of benign and malignant tumors. 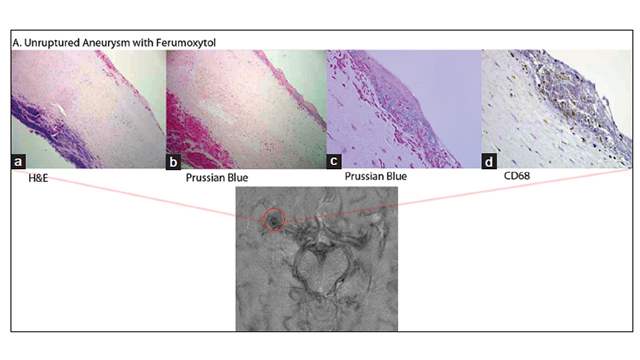 Photodynamic therapy of tumors requires the topical, systemic or oral administration of a photosensitizing compound,illumination of the tumor area by light of a specific wavelength and the presence of oxygen. Light activation of the photosensitizer transfers energy to molecular oxygen creating singlet oxygen, a highly reactive and toxic species that rapidly reacts with cellular components causing oxidative damage, ultimately leading to cell death. Tumor destruction caused by photodynamic therapy is not only a result of direct tumor cell toxicity via the generation of reactive oxygen species but there is also an immunological and vascular component involved. The immune response to photodynamic therapy has been demonstrated to significantly enhance its efficacy. 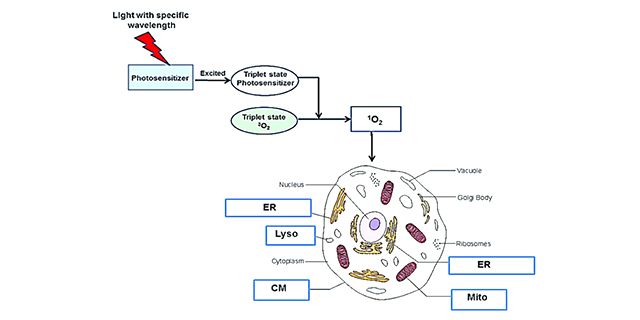 Depending on a number of factors, including type of photosensitizer, light dose and dose rate, photodynamic therapy has been shown to induce cell death via apoptosis, necrosis, autophagy and in particular immunogenic cell death. It is the purpose of this review to focus mainly on the role photodynamic therapy could play in the generation of specific anti-tumor immunity and vaccines for the treatment of brain tumors. Immunotherapy, while effective against lymphoid cancers and some solid tumors, has shown less benefit against pediatric brain tumors. Tumor heterogeneity, a suppressive immune microenvironment, and the blood-brain barrier have the potential to diminish any immune-based approach and limit efficacy. More importantly, most pediatric brain tumors are immunologically quiescent, stemming from a low mutational burden. 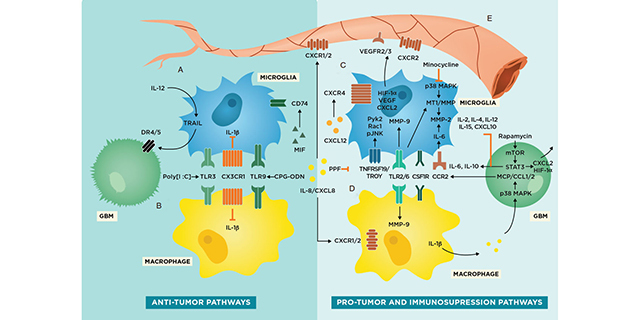 This review focuses on innate vs. adaptive immunotherapeutic approaches and describes how the immunologic context of pediatric brain tumors can help identify well-suited immunotherapies for our patients. In this framework, we will discuss past and current approaches using virotherapy, immunoconjugates, monoclonal antibodies, active immunization, and adoptive cellular therapy, and share our thoughts on how immunotherapy can cure children with brain tumors. Brain metastasis (BM) is very common in advanced non-small cell lung cancer (NSCLC) patients. The development of BM remains a serious complication associated with significant morbidity and mortality. The traditional approach has been largely focusing on local therapy with surgery and/or radiation. New approaches to treat BM in NSCLC are urgently needed to offer safe and effective therapy as well as to preserve neurocognitive function. There has been significant progress in development of systemic therapies to treat advanced NSCLC in recent years. Targeted therapy has been gradually incorporated into clinical practice to manage NSCLC with BM. Immunotherapy (IO) has revolutionized our treatment paradigm to manage advanced NSCLC. In this review we outline the systemic options for NSCLC-related BM and discuss IO in NSCLC. Finally, we describe the available data and future perspective to support the use of IO in NSCLC patients with BM. Aim: T11TS, a potent anti-gliomagenic glycoprotein, stimulates both peripheral and intracranial immune response. The status of bone marrow hematopoietic stem cells (BMHSCs), the cradle of regeneration of all blood cells, during gliomagenic global immune devastations has not yet been investigated. Therefore, we aimed to delineate the effects of T11TS on immature and mature compartments of hematopoietic machinery. Methods: Flowcytometric analysis of cultured BMHSCs was evaluated for assesing the expression pattern of early hematopoietic stem cells (HSCs) markers such as CD34+, Sca-1+, c-kit+ and also Angiopoietin-1 and Tie-2 both in normal, glioma, and in T11TS treated glioma-bearing animals. Immunofluresenece imaging and western blot analyses of BMHSCs were also carried out. Results: There was significant downregulation of HSCs-markers CD34+, Sca-1+, c-kit+ in ethyl nitrosourea-induced glioma-bearing animals followed by an increase in the expression level of Ang-1 and Tie-2 that determines the quiescence and self-renewability of stem cells. T11TS administration reversed the gliomagenic transformation of expression of the above mentioned markers. The results flowcytometric-analysis was also well corroborated with immunofluorescence imaging and western blot analysis. Conclusion: Collectively, the above experimental evidence hints towards gliomagenic maneuver of receptor expression of HSCs to derange the systemic immunity and T11TS mediated manipulation towards revival/rejuvenation of the same. Microglia and macrophages, two myeloid cell lineages with different origins, make up the majority of immune cells present in glioblastoma (GBM). However, much of the literature does not distinguish between microglia and macrophages, despite a growing body of evidence that demonstrates key structural and functional differences between the cell types. Furthermore, the current M1/M2 paradigm used to sub-classify microglia and macrophages has proven to be incomplete at best, with the growing amount of in vivo and genomic data incompatible with this dichotomy. Finally, a number of studies have already established that in the setting of the GBM tumor microenvironment, both microglia and macrophages are complicit in tumor progression. 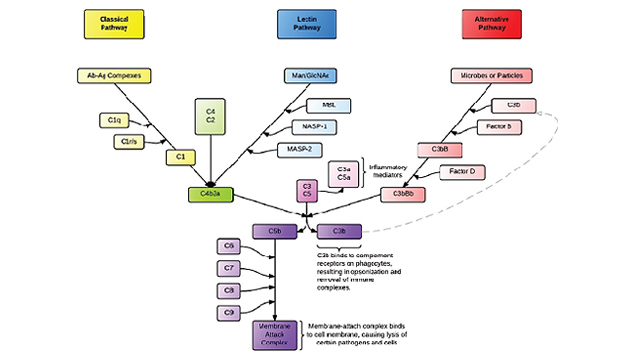 This review highlights the differences between microglia and macrophages, particularly in the context of GBM, and discusses at length several potential therapeutic strategies made possible by understanding specific pro-tumor and anti-tumor pathways in these myeloid populations. Ultimately, investigating the differences between microglia and macrophages offers insight into the progression of GBM, its marked resistance to current immunotherapy regimens, and future directions for new treatment modalities. A new era for cancer treatment has been ushered in with the field of cancer immunotherapy. After initial success with systemic malignancies, several of these promising treatments are being investigated for efficacy with primary and secondary brain tumors. Chimeric antigen receptor (CAR) T cells are being studied, both with systemic infusion and direct administration to the tumor and into the cerebrospinal fluid, with promising early results. Systemic CAR-T treatment can have serious systemic and neurological toxicities that are important for the practicing neurologist and neuro-oncologist to know and understand. This review aims to discuss adoptive cell therapies with a focus on CAR-T treatment. We review use of this therapy in brain cancers, particularly malignant glioma, and provide an overview of the toxicity of CAR-T treatment and its appropriate management. 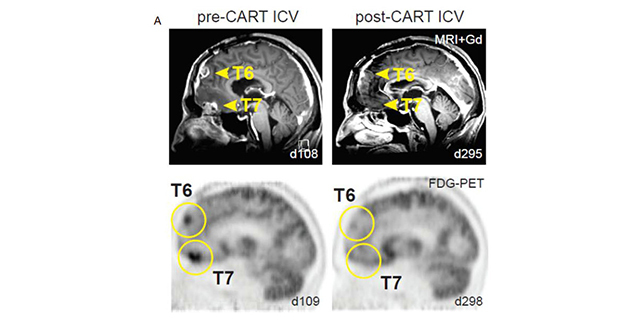 The therapeutic approach of adoptive lymphocyte transfer (ALT) using lymphocytes primed and expanded ex-vivo by exposure to total tumor RNA (ttRNA) containing dendritic cells (DCs) and administered after lymphodepletive host conditioning in patients with refractory melanoma with brain metastases has shown excellent objective responses indicating that the central nervous system (CNS) is not an immune privileged site and further paved the way for utilization of a similar approach in other cancers. We have shown that the use of ALT + ttRNA DCs following either myeloablative or non-myeloablative host conditioning is feasible and safe and appears to prolong survival in a proportion of children with recurrent medulloblastoma who had failed standard cytotoxic therapy. Further refinements in this promising approach are needed to improve outcomes and extend this treatment to a broad range of CNS malignancies. Glioblastoma multiforme (GBM), which is the most common primary central nervous system malignancy in adults, has long presented a formidable challenge to researchers and clinicians alike. Dismal 5-year survival rates of the patients with these tumors and the ability of the recurrent tumors to evade primary treatment strategies have prompted a need for alternative therapies in the treatment of GBM. 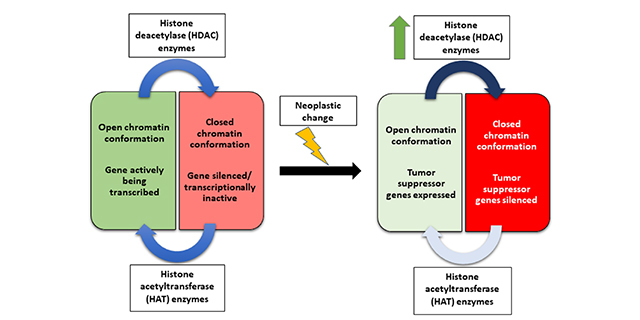 Histone deacetylase (HDAC) inhibitors are currently a potential epigenetic therapy modality under investigation for use in GBM with mixed results. While these agents show promise through a variety of proposed mechanisms in the pre-clinical realm, only several of these agents have shown this same promise when translated into the clinical arena, either as monotherapy or for use in combination regimens. This review will examine the current state of use of HDAC inhibitors in GBM, the mechanistic rationale for use of HDAC inhibitors in GBM, and then examine an exciting new mechanistic revelation of certain HDAC inhibitors that promote antitumor immunity in GBM. The details of this antitumor immunity will be discussed with an emphasis on application of this antitumor immunity towards developing alternative therapies for treatment of GBM. The final section of this article will provide an overview of the current state of immunotherapy targeted specifically to GBM. Glioma treatments are faced with challenges, including the inability to fully eliminate cancer stem cells, the immunosuppressive tumor microenvironment, and the blood brain barrier. Although progress has been made with surgical, radiation, and chemotherapies, prognosis for patients remains poor. Rapidly emerging immunotherapies may be able to address the challenges that conventional techniques cannot. Immunotherapies manipulate the patient’s immune system to selectively combat malignancies. Therapies often work to enhance T-cell and natural killer (NK) cell function, which can both eliminate tumor cells and enhance remission. Vaccines encourage in vivo development of anti-tumor T-cells and NK cells, while adoptive transfer techniques focus on engineering immune cells ex vivo before reintroducing them to patients. Vaccine and adoptive transfer therapies have been shown to induce enhanced immune responses in patients but have not always correlated with improved outcomes, likely because of the tumor immunosuppressive microenvironment. Checkpoint inhibitors can impair these tumor immunosuppressive capabilities. Although no one treatment has been able to consistently eliminate gliomas and maintain remission, combinations of vaccines or adoptive transfer techniques in conjunction with immune checkpoint inhibitors offers promise. Endogenous or exogenous insults can cause spinal cord injury (SCI), often resulting in the loss of motor, autonomic, sensory and reflex functions. The pathogenesis of SCI comprises two stages. The primary injury stage occurs at the moment of trauma and is characterized by hemorrhage and rapid cell death. The secondary injury stage occurs due to progression of primary damage and is characterized by tissue loss and functional disorder. One of the most important cellular mechanisms underlying secondary injury is glutamate excitotoxicity, which overactivates the calpain protease via excessive Ca2+ influx and induces neuronal apoptosis via p53 induction. Furthermore, Ca2+ influx elicits apoptosis by inducing p53, thus negatively affecting two pathways: the mitogenic extracellular signal-regulated kinase/mitogen-activated protein kinase (ERK/MAPK) pathway and the survival phosphoinositide 3-kinase/protein kinase B (PI3K/AKT) pathway. Speedy/rapid inducer of G2/M progression in oocytes (Speedy/RINGO) is a cell cycle regulatory protein that increases survival of p53-positive mitotic cells by inhibiting the apoptotic machinery. 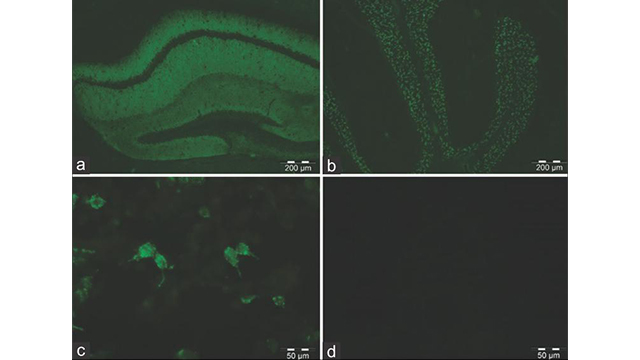 Moreover, this protein elicits p53-dependent anti-apoptotic effects on calpain-induced degeneration of primary hippocampal neurons, amyotrophic lateral sclerosis motor neurons, and astrocytes and microglia in spinal cord lesions. The pathophysiology of SCI has not been fully elucidated and this hinders the development of powerful therapeutic strategies. This review focuses on the cellular mechanisms underlying the anti-apoptotic effects of Speedy/RINGO and discusses how this protective function can possibly be exploited to facilitate recovery from SCI. Particular attention is paid to reversal of the negative effects on the ERK/MAPK and PI3K/AKT pathways via induction of p53. Aim: The pathogenesis of central nervous system infections (CNSI) has not been fully understood; some studies indicated that reactive oxygen species may induce brain damage. The aim of our study was to investigate serum antioxidant status in patients with CNSI. 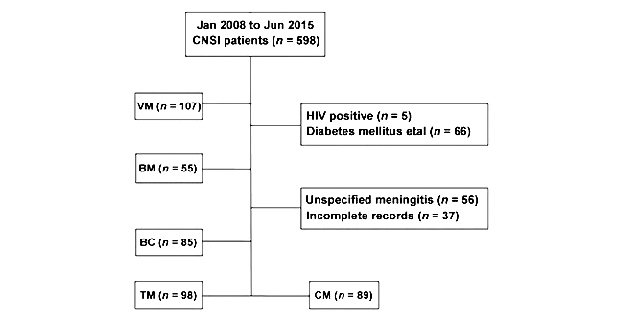 Methods: The serum levels of uric acid (UA), bilirubin and albumin of 548 individuals were enrolled in our study, comprising of 114 healthy controls (HC) and 434 patients with five different kinds of CNSI, which including viral meningitis and/or meningoencephalitis, cysticercosis of brain, tuberculous meningitis and/or meningoencephalitis, cryptococcus meningitis and/or meningoencephalitis, and bacterial meningitis and/or meningoencephalitis. Results: The data suggested that there were reducing levels of oxidation state (serum UA, bilirubin and albumin) in CNSI patients when compared with HC. Likewise, similar results were observed when cohorts were divided into male and female subgroups. Conclusion: The authors demonstrated that serum antioxidant status in patients with CNSI was lower; the reason may be due to exhaustion of antioxidant capacity. Therefore, enhancing antioxidant power and keeping oxidative stress and antioxidants in balance may be beneficial to the patients with CNSI. Aim: The herpes simplex virus (HSV), one of the most common viruses infecting humans, is featured by a high infection rate and usually causes complex disorders difficult to diagnose and treat. Disease progression is always combined with the specific interaction between organism and environment, but genetic factors play a decisive role in most pathogenic processes. Like most human disorders, individual difference has also been involved in the pathogenesis of HSV infection. The present study aimed to screen the potential gene loci that regulates human predisposition to HSV infection. Methods: With reference to previous studies, inbred mouse lines with significantly distinct predisposition to HSV infection were chosen for gene loci screening. Gene sites on mouse chromosome 17 associated with susceptibility to HSV infection were then identified by correlation analysis and genome-wide scanning technique. Results: Genes affecting the vulnerability of mice to HSV infection were mapped to three regions on the 17th mouse chromosome, D17MIT51.1, D17MIT39.1 and the region between D17MIT180.1 and D17MIT184. Conclusion: The results suggest that the mouse genetic background plays an important role in its susceptibility to HSV-1 infection, which might be regulated by multiple predisposing quantitative trait loci. Herpes simplex encephalitis (HSE) can cause permanent injury to the brain parenchyma. As such, it is usually treated as a medical emergency for which correct immediate diagnosis and introduction of specific therapies are critical for survival and prognosis. Here, the authors review the current status of diagnosis and treatments and discuss unsolved issues surrounding therapeutic interventions. The authors also highlight the current expectations for future management of HSE. Aim: Myasthenia gravis (MG) is a rare and heterogeneous disease for which there is no generally accepted standard of care. 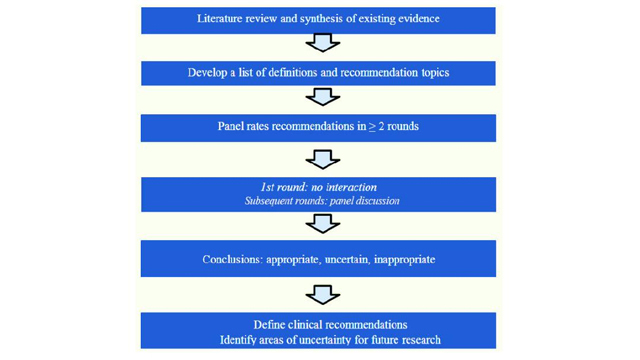 Thus, it is critical that MG experts develop consensus guidelines based on their practice and disease management to assist clinicians and provide advice for insurance companies, health organizations and institutional review boards. Methods: An international treatment guidance was developed based on national guidelines established in the US, Denmark, Norway, Germany, Japan, Netherlands, United Kingdom and Europe. The RAND/UCLA appropriateness method (RAM) was applied to reach consensus among 15 worldly renowned experts and experienced clinicians. Results: This paper introduced the RAM procedure with its principles and applications and conducted a brief review of the resulting 2016 international consensus guidance for MG in comparison to clinical experience and management of Chinese MG patients. Conclusion: The 2016 international consensus guidance is a major contribution to the treatment and management of MG, providing an up-to-date expert consensus to assist clinicians around the world, especially those with limited experience and/or practice in countries/regions that have limited resources to develop local treatment guidelines. It is also an important contribution showing how RAM can help to develop consensus guidance for treatment of rare diseases based on scientific findings and expert experience. Creutzfeldt-Jakob disease (CJD), which is caused by prion scrapie protein, is a rare, chronic, transmissible and fatal disease. Clinical manifestations of CJD include rapidly progressive dementia, cerebellar ataxia, visual disturbance, as well as pyramidal and extrapyramidal tract signs. Four subtypes of CJD have been reported, including sporadic, familial or genetic, iatrogenic and variant. Given the infectiousness and high mortality of the disease, it is imperative that earlier and more accurate diagnostic methods are developed. In the past years, 14-3-3 protein testing and periodic sharp wave complexes in electroencephalogram have been widely used in CJD clinical diagnosis; and the abnormal hyper-intensity in diffusion weighted imaging has also been used. Recently, there has been a focus on the diagnostic value of 18F-fluorodeoxyglucose positron emission tomography/computed tomography. New findings of potential biomarkers in cerebrospinal fluid and decreases in diffusion tensor imaging measures have emerged as having an association with CJD. Magnetic resonance spectroscopy has also drawn attention as an emerging method for diagnosis. In this review, the progress in auxiliary examinations of CJD is discussed and the potential, future diagnostic methods are introduced. Meningeal carcinomatosis (MC) is a disease that malignant tumor cells cultivate in the cerebrospinal fluid or meninges. With the development of therapy methods and new techniques, survival time of patients with tumor is prolonged, and the incidence of MC is increasing. Diagnosis is based on the evaluation of clinical manifestations, cerebrospinal fluid and neuroimaging findings. Furthermore, in recent years, the diagnostic value of the tumor-derived cell-free DNA in the cerebrospinal fluid (CSF) is promising and may improve the diagnostic yield of CSF analysis. Traditional treatments of MC include surgery, radiation therapy, systemic therapy, and intrathecal therapy. Recently, molecular targeted therapy and immunotherapy have received more and more attention. The authors review the epidemiology, pathogenesis, clinical manifestation, diagnosis and treatment of MC in solid cancer, and discuss the diagnosis and treatment options currently available as well as those under investigation. Hypoperfusion and hyperperfusion could be causes of early postoperative complications that lead to neurological deterioration in patients with moyamoya diseases (MMD) after superficial temporal artery (STA) and middle cerebral artery (MCA) anastomosis. Here, the authors described a case of child-onset bilateral MMD that manifested transient cerebral ischemia in the contralateral hemisphere after left STA-MCA bypass in young adulthood. A new onset of cerebral ischemia in the contralateral hemisphere and transient neurological deterioration suggested the fragile hemodynamics of MMD during early perioperative period. Serial evaluation of postoperative cerebral hemodynamics and perfusion might facilitate targeted management in patients with unstable or advanced MMD. Injury to the central nervous system (CNS) is common, and though it has been well studied, many aspects of traumatic brain injury (TBI) and stroke are poorly understood. TBI and stroke are two pathologic events that can cause severe, immediate impact to the neurostructure and function of the CNS, which has been recognized recently to be exacerbated by the body’s own immune response. Although the brain damage induced by the initial trauma is most likely unsalvageable, the secondary immunologic deterioration of neural tissue gives ample opportunity for therapeutic strategists seeking to mitigate TBI’s secondary detrimental effects. 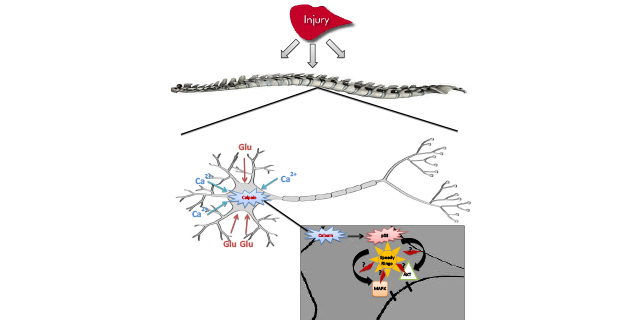 The purpose of this paper is to highlight the cell death mechanisms associated with CNS injury with special emphasis on inflammation. The authors discuss sources of inflammation, and introduce the role of the spleen in the systemic response to inflammation after CNS injury. Aim: The purpose of this study is to investigate the incidence, distribution and risk factors of cerebral microbleeds (CMBs) and the relation between CMBs and inflammation in ischemic cerebrovascular disease. Methods: Two hundred and one patients without acute infarction or transient ischemic attack were enrolled. 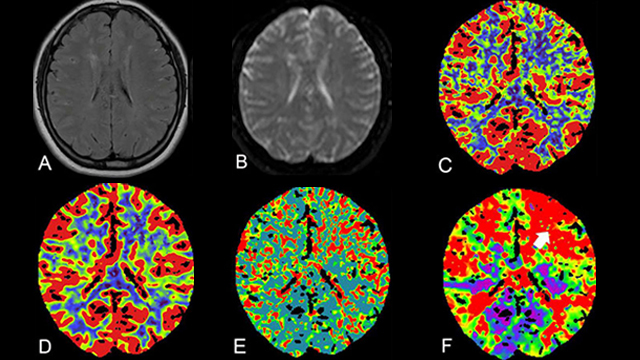 The presence and number of CMB were assessed on susceptibility-weighted imaging. The traditional risk factors of CMB were recorded. Levels of high-sensitivity C-reactive protein (hs-CRP), interleukin-6 (IL-6), and matrix metalloproteinase-9 (MMP-9) were tested. Logistic regression analyses were used for multiple-factor analysis of risk factors of CMB. Results: Of the 201 patients, 49 (24.38%) had CMB. Multivariate logistic regression analyses showed that the age, the prevalence of hypertension, silent lacunar infarction, white matter lesion, Montreal Cognitive Assessment Score, the using rate of antithrombotic drugs and levels of hs-CRP, IL-6, MMP-9 were the risk factors for CMB. After adjustments for traditional risk factors, inflammatory marker levels remained to be associated with CMBs. The adjusted odd ratios of hs-CRP, IL-6 and MMP-9 were 1.745 (1.342-2.270), 1.223 (1.018-1.533) and 1.284 (1.082-1.423), respectively. Furthermore, inflammatory marker levels were the risk factor for deep or infratentorial CMBs and lobar CMBs. Conclusion: The age, prevalence of hypertension, silent lacunar infarction, white matter lesion, MoCA Score, the using rate of antithrombotic drugs and serum hs-CRP, IL-6, and MMP-9 levels were the independent risk factors for CMBs. Ischemic stroke causes the depletion of energy and induce excitotoxicity and neuroinflammation in the brain that results from thrombotic blockage. Neuroinflammation occurs initially depending on activated resident microglia that has the same function as the macrophage. 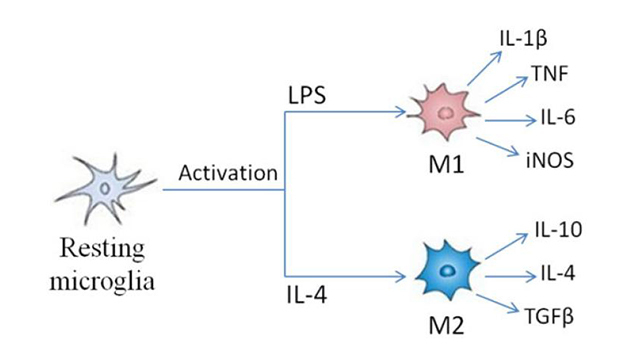 Activated microglia participates in the neuroinflammatory process by phagocytosing the injured brain cells and producing the pro- and anti-inflammatory mediators. In this review, the authors present an overview of the role of microglia in mediating neuroinflammation in ischemic stroke. Endoglin (ENG, also known as CD105) is a transforming growth factor β (TGFβ) associated receptor and is required for both vasculogenesis and angiogenesis. Angiogenesis is important in the development of cerebral vasculature and in the pathogenesis of cerebral vascular diseases. 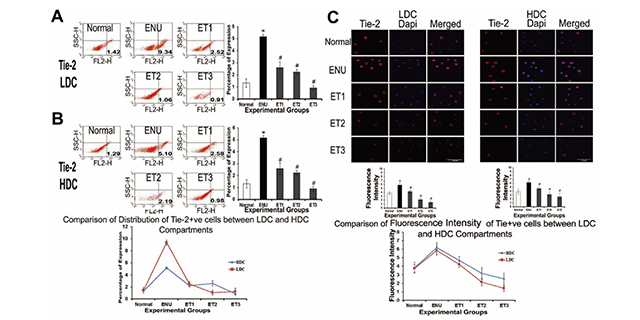 ENG is an essential component of the endothelial nitric oxide synthase activation complex. Animal studies showed that ENG deficiency impairs stroke recovery. ENG deficiency also impairs the regulation of vascular tone, which contributes to the pathogenesis of brain arteriovenous malformation (bAVM) and vasospasm. In human, functional haploinsufficiency of ENG gene causes type I hereditary hemorrhagic telangiectasia (HHT1), an autosomal dominant disorder. Compared to normal population, HHT1 patients have a higher prevalence of AVM in multiple organs including the brain. Vessels in bAVM are fragile and tend to rupture, causing hemorrhagic stroke. High prevalence of pulmonary AVM in HHT1 patients are associated with a higher incidence of paradoxical embolism in the cerebral circulation causing ischemic brain injury. Therefore, HHT1 patients are at risk for both hemorrhagic and ischemic stroke. This review summarizes the possible mechanism of ENG in the pathogenesis of cerebrovascular diseases in experimental animal models and in patients. Voltage-gated potassium channels (VGKCs) represent a group of tetrameric signaling proteins with several functions, including modulation of neuronal excitability and neurotransmitter release. Moreover, VGKCs give a key contribution to the generation of the action potential. VGKCs are complexed with other neuronal proteins, and it is now widely known that serum autoantibodies directed against VGKCs are actually directed against the potassium channel subunits only in a minority of patients. By contrast, these autoantibodies more commonly target three proteins that are complexed with alpha-dendrotoxin-labeled potassium channels in brain extracts. These three proteins are contactin-associated protein-2 (Caspr-2), leucine-rich, glioma inactivated 1 (LGI-1)-protein and the protein Tag-1/contactin-2. Neoplasms are detected only in a minority of seropositive patients for VGKC complex-IgG and do not significantly associate with Caspr-2 or LGI-1. Among all the cancers described in association with VGKC complex-IgG, lung carcinoma, thymoma, and hematologic malignancies are the most commonly detected. We will review all the major neurological conditions associated with VGKC complex-IgG. These include Isaacs’ syndrome, Morvan syndrome, limbic encephalitis, facio-brachial dystonic seizures, chorea and other movement disorders, epilepsy, psychosis, gastrointestinal neuromuscular diseases, a subacute encephalopathy that mimics Creutzfeldt-Jakob prion disease both clinically and radiologically and autoimmune chronic pain. The vast majority of these conditions are reversible by immunotherapy, and it is becoming increasingly recognized that early diagnosis and detection of VGKC complex-IgG is critical in order to rapidly start the treatment. As a result, VGKC complex-IgG are now part of the investigation of patients with unexplained subacute onset of epilepsy, memory or cognitive problems, or peripheral nerve hyperexcitability syndromes. Anti-N-methyl-D-aspartate receptor (NMDAR) encephalitis has been increasingly recognized in recent years. 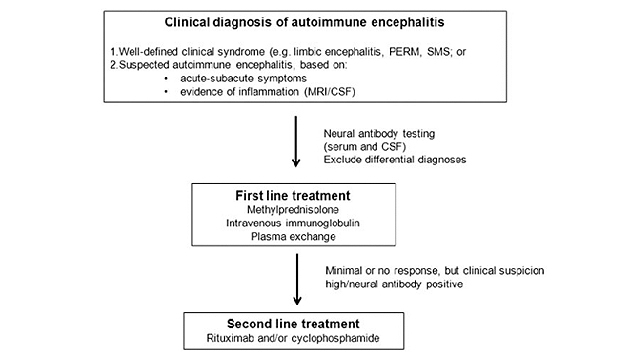 This condition may be the most common cause of antibody-mediated encephalitis worldwide. The majority of patients are young at the time of onset, female, and present with an acute-to-subacute onset of behavioral changes followed by seizure, abnormal movement, autonomic dysfunction, and finally hypoventilation with coma if left untreated. The immunopathogenesis of this disease may be due to antibody-mediated internalization of NMDARs from synapses, which results in the dysfunction of particular brain regions (especially the hippocampus and frontostriatal area). Compared to serum, the cerebrospinal fluid permits the more sensitive detection of anti-NMDAR antibody. Ovarian teratoma may be present in up to 40% of patients but is less frequent in children or late-onset disease (> 45 years old). The severity at the time of disease onset and time to appropriate immunotherapy (high-dose steroid plus plasmapheresis or intravenous immunoglobulin) are independent factors that are associated with good outcomes. Over the past decade the discovery of novel forms of encephalitis associated with neuronal surface antibodies had changed the paradigms for diagnosing and treating disorders that were previously mischaracterized. Recognition of clinical syndromes, consistent methods of diagnosis, and early targeted immunotherapy can lead to a favorable outcome in diseases that may be associated with significant disability or death if left untreated. Here the conditions associated with neuronal surface antibodies are briefly reviewed, some general aspects of these syndromes are considered and guidelines that could help in the recognition of these disorders are suggested. Furthermore, a diagnostic algorithm to detect and characterize neuronal cell surface autoantibodies is suggested and some of the caveats of serum testing are outlined. Future directions will involve the identification of novel autoantibodies, the standardization of methods to detect and characterize them, as well as evaluation of the most efficacious therapeutic strategies in patients with established diagnosis of autoimmune encephalitis. 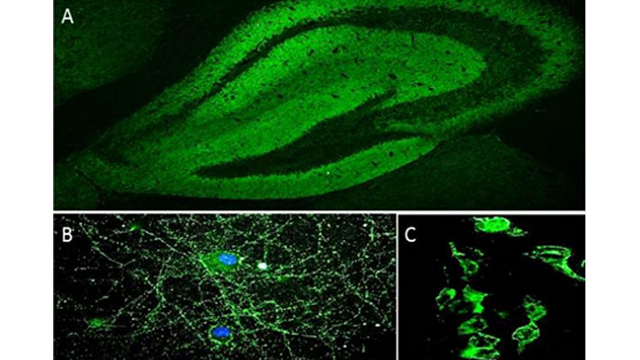 Neuronal surface antibody syndromes (NSAS) encompass a variety of disorders associated with “neuronal surface antibodies”. These share clinical and neuroradiological features that pose challenges related to their recognition and treatment. Recent epidemiological studies show a clear predominance for the glutamate-N-methyl-D-aspartate receptor encephalitis in both adults and pediatric population. Despite this, the overall NSAS’s incidence remains underestimated, and diagnosis persists to be not always easy to achieve. 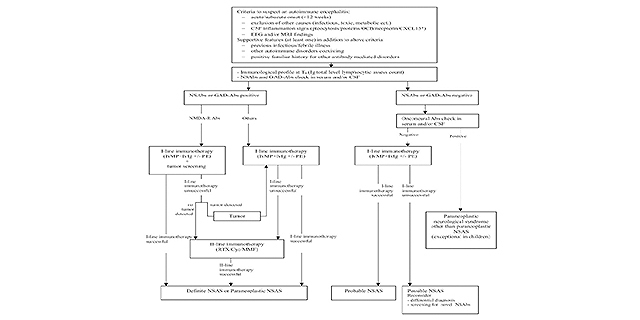 Based on current literature data, in this paper the authors propose a diagnostic pathway to approach and treat pediatric NSAS. An autoimmune etiology can be suggested through the integration of clinical, immunological, electrophysiological and neuroradiological data. On that basis, a target treatment can be started, consisting of corticosteroids and intravenous immunoglobulin or plasma exchange as a first-line immunotherapy, followed by second-line drugs including rituximab, cyclophosphamide or mycophenolate mophetil, if the case. In children a prompt diagnosis and a targeted treatment may lead to a better clinical outcome. Nevertheless further studies are required to assess the need of more tailored treatments according to long-term outcome findings and prognostic factors in different NSAS. Multiple sclerosis (MS) is the most common inflammatory demyelinating brain disease. The occurrence of psychiatric disorders, especially for major depression, in the course of MS is high. Reports concerning bipolar disorder (BD) remain rather scarce although early descriptions were found in the old neurological literature. The purpose of this article is to provide a critical review of the epidemiology, comorbidity and treatment findings regarding BD preceding the onset of MS. According to magnetic resonance imaging (MRI) studies, brain white matter (WM) abnormalities have been suggested to play a critical role in the pathogenesis of major depressive disorder (MDD) and related suicidal behavior. However, MRI findings may be limited by low spatial resolution; therefore an important contribution to the understanding of the role and significance of WM alterations derived by the development of the most recent magnetic resonance techniques, such as diffusion tensor imaging (DTI). Several DTI studies reported an association between altered WM integrity and MDD/suicidal behavior. Microstructural WM abnormalities may be located in neural circuits critically implicated in emotional processes and mood regulation resulting in enhanced vulnerability to psychiatric morbidity. WM abnormalities detected using DTI may contribute to functional deficits and help to clarify the pathophysiological mechanisms underlying MDD as well as suicidal behavior. By a clinical point of view, research also suggested that affective temperaments may play a relevant role in the psychopathological characteristics of mood disorders, clinical trajectory of episodes and polarity, long-term outcome and suicidality. Unfortunately, only few studies investigated the association between affective temperaments and WM abnormalities and discussed their possible implications in patients with MDD and suicidal behavior. Using a comprehensive search of Medline database, the aim of the present study was to critically review the current literature on the association between WM alterations as assessed by MRI and DTI techniques, affective temperaments, MDD and suicidal behavior. Neuroinflammation has been proposed as a strong biological factor underlying the development of neuropsychiatric diseases. A role for dysregulation of the immune system was initially suggested in depressive disorders and subsequently extended to other illnesses, including bipolar disorder (BD). Indeed, there is growing evidence confirming the presence of a generalized pro-inflammatory state in BD patients, involving alterations in cytokine, acute-phase proteins, and complement factor secretion, white blood cell differentiation, microglial activation, arachidonic acid signaling pathways, and increased oxidative stress markers. Medications commonly used to treat BD, such as lithium, antiepileptics and antipsychotics, show some immunoregulatory activity both in vitro and in vivo. The aim of our study was to review the role of different inflammatory mechanisms, specifically in the development of excitatory symptoms, via a systematic PubMed search of the literature. Despite the high variability of results amongst studies, we found evidence indicating specific alterations of the inflammatory response during manic and mixed states of BD. These findings may help to clarify some of the complex mechanisms underlying the development of excitatory symptoms and suggest a potential role for drugs targeting the inflammatory system as new therapeutic options. Recent research on autoimmune disorders suggest additional links between systemic and central nervous system (CNS) pathophysiology, among which the identification of antibody-induced limbic encephalitis provided the strongest evidence for the potential involvement of autoimmunity in the pathogenesis of severe mood and psychotic symptoms. In these illnesses, psychiatric symptoms predominate in the initial phase of the disorder in up to 70% of the cases, and they often lead patients to early psychiatric evaluation. For this reason it is very important to increase the limited knowledge among psychiatrists about these autoimmune neuropsychiatric diseases, which can mimic psychiatric syndromes, in particular, those typically presented in severe mood disorders and schizophrenia. On the other hand, similarities in clinical presentation suggest that neuroinflammation and systemic immune dysregulation may play a role in the pathophysiology of severe mood and psychotic disorders. A complex interaction between periphery and immune cells of the CNS may result in cellular damage through mechanisms involving excitotoxicity, oxidative stress, and mitochondrial dysfunction. These pathways are possibly shared between comorbid medical disorders and severe mood and psychotic disorders and may reflect common underlying vulnerability. Gamma-aminobutyric acid (GABA) possibly plays a causative role in mood disorders. This hypothesis originated with studies on the beneficial effect of valproate in mania and as a mood stabilizer. Since valproate is known for its action in increasing the level of GABA, it was indirectly suggested that decreasing levels of GABA were responsible for mood alterations. To identify factors causing the decreased levels of GABA, studies have concentrated on the activity of the enzyme L-glutamic-acid decarboxylase (GAD), which catalyzes the transformation of glutamate to GABA, as a decreasing function of this enzyme induces lower levels of the neurotransmitter. Moreover, a very limited amount of research investigated the possible role of GAD antibodies (GADA) in determining a decreased enzymatic function of GAD. If these findings are confirmed, it will be possible to improve diagnosis and treatment of mood disorders. In addition, if the presence of GADA is associated with a genetic trait, this would allow and facilitate early diagnoses. A pathophysiological relationship has been reported between inflammatory processes, decreased levels of neurotrophins, increased oxidative stress and psychiatric disorders in both juvenile and adult ages. Moreover, this relationship remains unclear in juvenile bipolar disorder (BD). 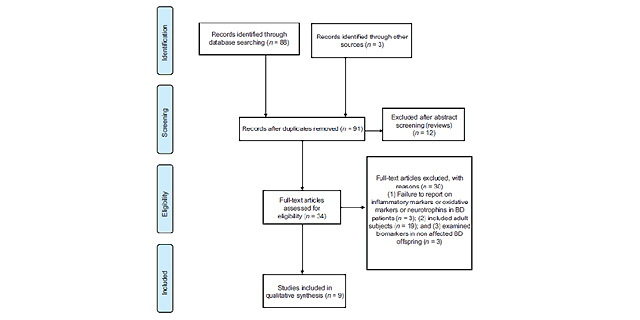 We performed a systematic literature review of studies reporting measurements of inflammatory markers, oxidative stress markers or neurotrophins in juvenile and young adult subjects with BD. Concordant findings showed that inflammatory markers are increased since the earlier stages of BD. A positive correlation between decreased levels of a peripheral brain-derived neurotrophic factor and juvenile BD is controversial suggesting that those changes might occur only during the late stage of BD. No changes in central GSH levels were reported in young adult age BD indicating that oxidative stress may be an outcome of long illness duration and repeated affective episodes. In conclusion, preliminary findings indicate that certain relationship exists between inflammatory process and juvenile BD but evidences are insufficient to support a causal relationship. Adequately powered and prospective studies are warranted to clarify the role of inflammation, neurotrophins and oxidative stress in juvenile BD. 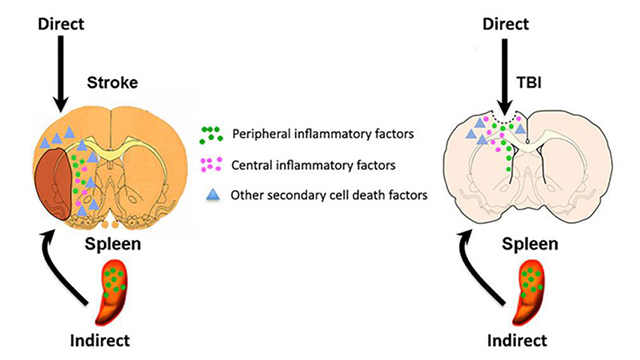 Recent literature based on peripheral immunity findings speculated that neuroinflammation, with its connection to microglial activation, is linked to bipolar disorder. The endorsement of the neuroinflammatory hypotheses of bipolar disorder requires the demonstration of causality, which requires longitudinal studies. We aimed to review the evidence for neuroinflammation as a pathogenic mechanism of bipolar disorder. We carried-out a hyper inclusive PubMed search using all appropriate neuroinflammation-related terms and crossed them with bipolar disorder-related terms. The search produced 310 articles and the number rose to 350 after adding articles from other search engines and reference lists. Twenty papers were included that appropriately tackled the issue of the presence (but not of its pathophysiological role) of neuroinflammation in bipolar disorder. Of these, 15 were post-mortem and 5 were carried-out in living humans. Most articles were consistent with the presence of neuroinflammation in bipolar disorder, but factors like treatment may mask it. All studies were cross-sectional, preventing causality to be inferred. Thus, no inference can be currently made about the role of neuroinflammation in bipolar disorder, but a link is likely. The issue remains little investigated, despite an excess of reviews on this topic. Cerebral aneurysm formation, growth and rupture are thought to be the result of a complex interaction between cerebrovascular hemodynamics and pathobiology. Recently, new evidence has emerged regarding the role of inflammation in the walls of cerebral aneurysms. Noninvasive methods to characterize the degree of inflammation in aneurysms could enable clinicians to estimate the risk of future aneurysm growth and rupture, influencing treatment. This review examines emerging techniques of imaging inflammatory biomarkers in cerebral aneurysms. Multiple inflammatory factors, playing a crucial role in cerebral aneurysm formation, have been identified. Tumor necrosis factor-alpha (TNF-α) has been revealed to have a close connection with several risk factors that affect aneurysm formation. Remarkable expression in aneurysm walls of mRNA for TNF-α has been observed in humans. Possible therapeutic interventions to reduce the formation of cerebral aneurysms may include the inhibition of mediators of inflammation. The central nervous system is an immunologically active environment where several components of the immune and inflammatory response interact among them and with the constituents of nervous tissue and vasculature in a critically orchestrated manner, influencing physiologic and pathologic processes. In particular, inflammation takes a central role in the pathogenesis of intracranial aneurysms (IAs). 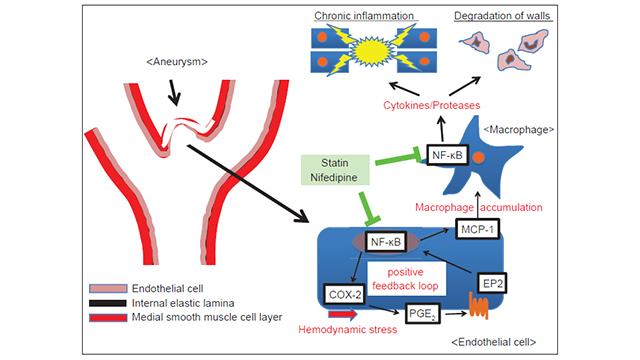 The common pathway for aneurysm formation involves endothelial dysfunction and injury, a mounting inflammatory response, vascular smooth muscle cells (VSMCs) phenotypic modulation, extracellular matrix remodeling, and subsequent cell death and vessel wall degeneration. We conducted a literature review (1980-2014) by Medline and EMBASE databases using the searching terms “IA” and “cerebral aneurysm” and further search was performed to link the search terms with the following key words: inflammation, hemodynamic(s), remodeling, macrophages, neutrophils, lymphocytes, complement, VSMCs, mast cells, cytokines, and inflammatory biomarkers. The aim of this review was to summarize the most recent and pertinent evidences regarding the articulated processes of aneurysms formation, growth, and rupture. Knowledge of these processes may guide the diagnosis and treatment of these vascular malformations, the most common cause of subarachnoid hemorrhage, which prognosis remains dismal. Outcomes following aneurysmal subarachnoid hemorrhage remain poor in many patients, despite advances in microsurgical and endovascular management. Consequently, considerable effort has been placed in determining the mechanisms of aneurysm formation, growth, and rupture. Various environmental and genetic factors are implicated as key components in the aneurysm pathogenesis. Currently, sufficient evidence exists to incriminate the inflammatory response as the common pathway leading to aneurysm generation and rupture. Central to this model is the interaction between the vessel wall and inflammatory cells. 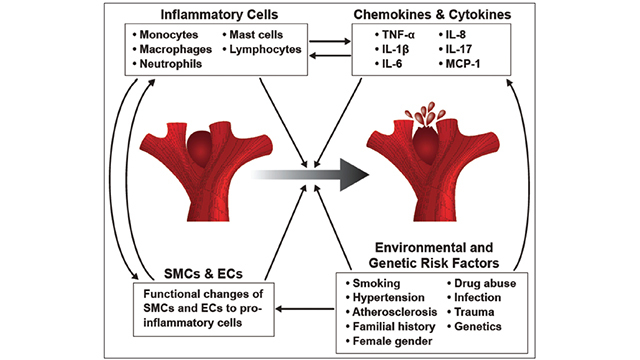 Dysfunction of the endothelium and vascular smooth muscle cells (VSMCs) promotes a chronic pathological inflammatory response that progressively weakens the vessel wall. We review the literature pertaining to the cellular and chemical mechanisms of inflammation that contribute to aneurysm development. 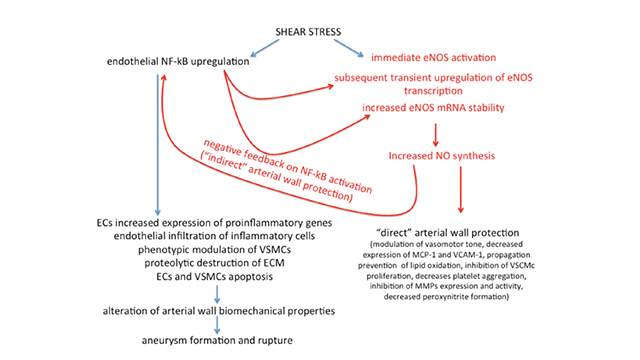 Hemodynamic stress and alterations in blood flow are discussed regarding their role in promoting chronic inflammation. 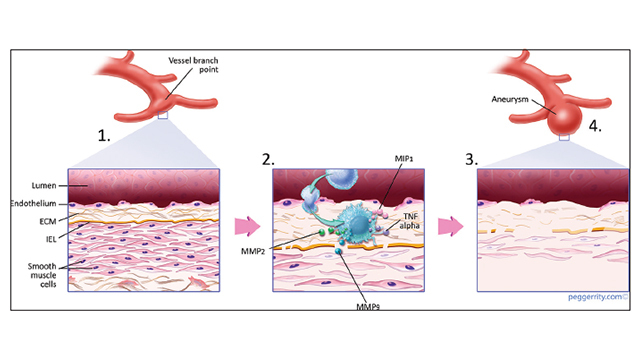 Endothelial cell and VSMC dysfunction are examined concerning vascular remodeling. 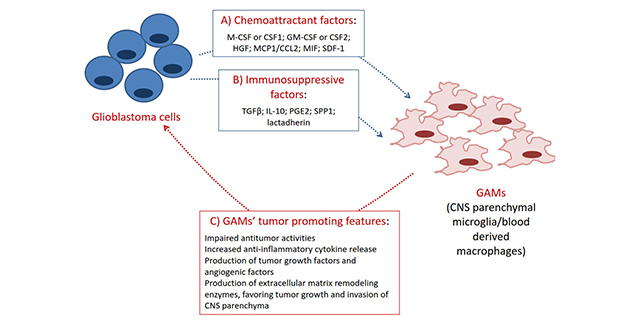 The contribution of inflammatory cytokines, especially tumor necrosis factor-α is illustrated. Inflammatory cell infiltration, particularly macrophage-mediated deterioration of vascular integrity, is reviewed. We discuss the inflammation as a means to determine aneurysms at greatest risk of rupture. Finally, future therapeutic implications of pharmacologic modulation of the inflammation are discussed. Intracranial aneurysms are a life-threatening cerebrovascular pathology with a probability of spontaneous rupture. 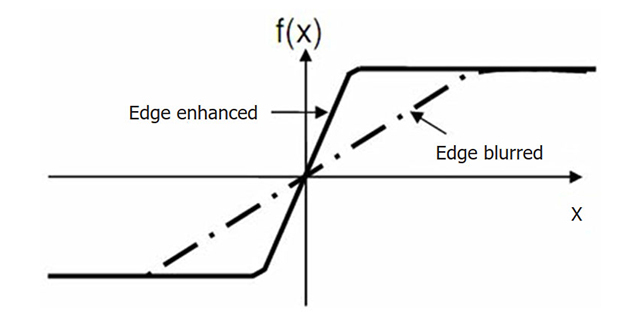 Current intervention techniques carry inherent risk. Recent investigation has reinforced inflammation’s role in the pathophysiological process of cerebral aneurysms. These data suggest alternative diagnostic and noninvasive therapeutic strategies. Furthermore, novel characteristics of the underlying disease have been elucidated through distinct bioinformatic and gene expression profile analyses. This article will emphasize the most recent investigation, highlighting findings of clinical significance and etiological relevance. The treatment of cerebral aneurysms (CAs) is of social importance, because poor outcomes result in subarachnoid hemorrhages after rupture. However, there is currently no medical treatment available to prevent the progression and rupture of CAs, which results in a large number of patients without receiving treatment. Recent studies using human samples have revealed the presence of inflammatory responses in lesions and also the possible correlation of inflammation with CA progression or rupture. Furthermore, experimental studies using animal models of CAs have supported the notion from human studies and have clarified the crucial contribution of inflammation to the pathogenesis. In this process, a vicious cycle/positive feedback loop includes the nuclear factor-kappa B (NF-κB) activation, which plays a role in amplifying inflammatory responses to the point of chronicity. 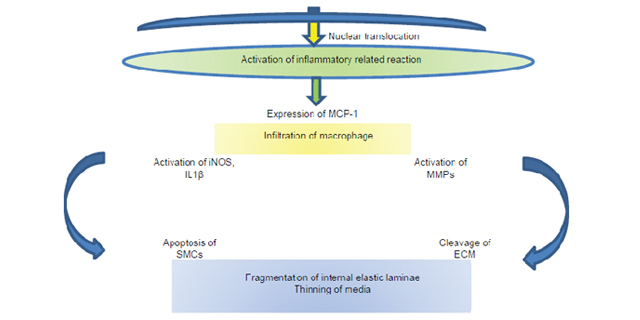 In addition, the infiltration of macrophages via NF-κB-mediated monocyte chemotactic protein 1 induction expands inflammation in whole arterial walls and contributes to the degeneration of media by producing various cytokines and tissue-destructive proteases. These series of studies have provided an important insight - antiinflammatory drugs can be therapeutically significant in the treatment of CAs. Indeed, in animal models, some drugs with an antiinflammatory effect effectively suppressed CA formation and progression, which supports this hypothesis. In addition, in human cases, some case-control studies have reported the preventive effect of statins and nonsteroidal antiinflammatory drugs on CA rupture. Therefore, the development of novel medical treatment for preventing the progression and rupture of CAs is needed in the near future. In this literature review, articles were selected by performing a PubMed search using the key words “cerebral aneurysm” and “inflammation”. Blake E. S. Taylor, ... Edward Sander Connolly Jr. The natural history of unruptured intracranial aneurysms (IAs) is poorly understood. At present, risk factors for aneurysm rupture are limited to demographics and rudimentary anatomic features of the aneurysm. The first sign of aneurysm destabilization and rupture may be subarachnoid hemorrhage, a potentially devastating brain injury with high morbidity and mortality. An emerging body of literature suggests a complex inflammatory cascade likely promotes aneurysm wall remodeling and progressive ballooning of the arterial wall, ultimately terminating in aneurysm rupture. These events likely begin with hemodynamic, flow-related endothelial injury; the injured endothelium stimulates inflammation, including the recruitment and transmigration of inflammatory cells, particularly macrophages. Various proteases are secreted by the inflammatory infiltrate, resulting in degradation of the extracellular matrix and the structural changes unique to IAs. Detailed understanding of these inflammatory processes may result in (1) early identification of patients at high risk for aneurysm rupture, perhaps via arterial wall imaging, and (2) targeted, noninvasive therapies to treat or even prevent cerebral aneurysms. Ruptured intracranial aneurysms (IAs) affect a small proportion of the population; however, the morbidity and mortality is disproportionally high. Although little is known about IA formation, progression, and rupture, mounting evidence suggests that inflammation may play an important role in IA pathogenesis. There is emerging evidence to suggest that leukocytes play a key role in generating and maintaining a pathologic inflammatory response that leads to aneurysm formation and rupture. We present the current literature pertaining to the role of leukocytes in aneurysm formation, progression, and rupture. The contributions of individual cell types are detailed, with special attention paid to the cytokine and molecular profiles. The role of magnetic resonance imaging as a means by which to evaluate aneurysm-associated inflammation is reviewed. Finally, we discuss leukocytes as potential targets of pharmacologic intervention.